Picea rubens, commonly known as red spruce, is a species of spruce native to eastern North America, ranging from eastern Quebec and Nova Scotia, west to the Adirondack Mountains and south through New England along the Appalachians to western North Carolina. This species is also known as yellow spruce, West Virginia spruce, eastern spruce, and he-balsam. Abies americana K.Koch nom. illeg. Abies rubra (Du Roi) Poir. Picea nigra var. rubra (Du Roi) Engelm. Picea rubra (Du Roi) Link nom. illeg. Pinus abies var. acutissima Münchh. Pinus americana Gaertn. nom. illeg. Pinus rubra (Du Roi) D.Don nom. illeg. Pinus rubra var. violacea Endl. Red spruce is a perennial, shade-tolerant, late successional coniferous tree that under optimal conditions grows to 18–40 m (59–131 ft) tall with a trunk diameter of about 60 cm (24 in), though exceptional specimens can reach 46 m (151 ft) tall and 100 cm (39 inches) in diameter. It has a narrow conical crown. The leaves are needle-like, yellow-green, 12–15 mm (15⁄32–19⁄32 in) long, four-sided, curved, with a sharp point, and extend from all sides of the twig. The bark is gray-brown on the surface and red-brown on the inside, thin, and scaly. The wood is light, soft, has narrow rings, and has a slight red tinge. The cones are cylindrical, 3–5 cm (1 1⁄4–2 in) long, with a glossy red-brown color and stiff scales. The cones hang down from branches. Red spruce grows at a slow to moderate rate, lives for 250 to 450+ years, and is very shade-tolerant when young. It is often found in pure stands or forests mixed with eastern white pine, balsam fir, or black spruce. Along with Fraser fir, red spruce is one of two primary tree types in the southern Appalachian spruce-fir forest, a distinct ecosystem found only in the highest elevations of the Southern Appalachian Mountains. Its habitat is moist but well-drained sandy loam, often at high altitudes. Red spruce can be easily damaged by windthrow and acid rain. Notable red spruce forests can be seen at Gaudineer Scenic Area, a virgin red spruce forest located in West Virginia, the Canaan Valley, Roaring Plains West Wilderness, Dolly Sods Wilderness, Spruce Mountain and Spruce Knob all also in West Virginia and all sites of former extensive red spruce forest. Some areas of this forest, particularly in Roaring Plains West Wilderness, Dolly Sods Wilderness as well as areas of Spruce Mountain are making a rather substantial recovery. It is closely related to black spruce, and hybrids between the two are frequent where their ranges meet. Genetic data suggests that the red spruce peripatrically speciated from the black spruce during the Pleistocene due to glaciation. 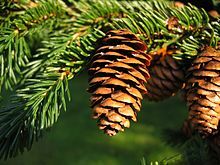 Red spruce is used for Christmas trees and is an important wood used in making paper pulp. It is also an excellent tonewood, and is used in many higher-end acoustic guitars and violins, as well as musical soundboard. The sap can be used to make spruce gum. Leafy red spruce twigs are boiled as a part of making spruce beer. Also it can be made into spruce pudding. It can also be used as construction lumber and is good for millwork and for crates. Red spruce is the provincial tree of Nova Scotia. Like most trees, red spruce is subject to insect parasitism. Their insect enemy is the spruce budworm, although it is a bigger problem for white spruce and balsam fir. Other issues that have been damaging red spruce has been the increase in acid rain and current climate change. The Central Appalachian Spruce Restoration Initiative (CASRI) seeks to unite diverse partners with the goal of restoring historic red spruce ecosystems across the high-elevation landscapes of central Appalachians. The partners that make up this diverse group are Appalachian Mountain Joint Venture, Appalachian Regional Reforestation Initiative, Canaan Valley National Wildlife Refuge, Natural Resources Conservation Service, The Mountain Institute, The Nature Conservancy, Trout Unlimited, U.S. Forest Service Northern Research Station, U.S. Forest Service Monongahela National Forest, West Virginia Division of Natural Resources, West Virginia Division of Forestry, West Virginia Highlands Conservancy, West Virginia State Parks, and West Virginia University. Prior to the late 1800s, 600,000 hectares (1,500,000 acres) of red spruce were in West Virginia. In the late 1800s and early 1900s, a vast amount of logging began in the state and the number of red spruce dwindled to 12,000 hectares (30,000 acres). Silviculture is being used to help restore the population of the lost red spruce. Significant efforts have been made to increase the growth of red spruce trees in western North Carolina. Most notably by Molly Tartt on behalf of the Daughters of the American Revolution. Tartt, a resident of Brevard North Carolina, embarked on a mission to find the lost red spruce Pisgah Forest that had been planted by the DAR as a memorial to the lives lost during the American Revolution. The forest, consisting of 50,000 trees was dedicated in 1940 and had until recently been forgotten until Tartt located and identified the forest. Wikimedia Commons has media related to Picea rubens. ^ Farjon, A. (2013). "Picea rubens". IUCN Red List of Threatened Species. IUCN. 2013: e.T42335A2973542. doi:10.2305/IUCN.UK.2013-1.RLTS.T42335A2973542.en. Retrieved 11 November 2016. ^ "Picea rubens Sarg.". World Checklist of Selected Plant Families (WCSP). Royal Botanic Gardens, Kew – via The Plant List. ^ a b c d Taylor, Ronald J. (1993). "Picea rubens". In Flora of North America Editorial Committee (ed.). Flora of North America North of Mexico (FNA). 2. New York and Oxford – via eFloras.org, Missouri Botanical Garden, St. Louis, MO & Harvard University Herbaria, Cambridge, MA. ^ a b c Earle, Christopher J., ed. (2018). "Picea rubens". The Gymnosperm Database. ^ Blum, Barton M. (1990). "Picea rubens". In Burns, Russell M.; Honkala, Barbara H. (eds.). Conifers. Silvics of North America. Washington, D.C.: United States Forest Service (USFS), United States Department of Agriculture (USDA). 1 – via Southern Research Station (www.srs.fs.fed.us). ^ Peattie, Donald Culross (1948-01-01). A Natural History of Trees of Eastern and Central North America. Houghton Mifflin Harcourt. p. 51. ISBN 0-395-58174-5. ^ "Red Spruce (Rubens)". Garden Guides. Retrieved 27 February 2014. ^ Dumais, D; Prevost, M (June 2007). "Management for red spruce conservation in Quebec: The importance of some physiological and ecological characteristics – A review". Forestry Chronicle. 83 (3): 378–392. doi:10.5558/tfc83378-3. Retrieved 27 February 2014. ^ "Red Spruce" (PDF). USDA NRCS. Retrieved 26 February 2014. ^ a b "Red Spruce". A handbook of Maritime trees. Atlantic Forestry Centre. Archived from the original on 2008-08-18. ^ White, Peter (2006). "Boreal Forest". Encyclopedia of Appalachia. University of Tennessee Press. pp. 49–50. ^ "Red Spruce". The Wood Database. Retrieved 27 February 2014. ^ Houle, Daniel (2012). "Compositional vegetation changes and increased red spruce abundance during the Little Ice Age in a sugar maple forest of north-eastern North America". Plant Ecology. 213 (6): 1027–1035. doi:10.1007/s11258-012-0062-0. ^ Burks, Evan (Dec 2010). "Return of the Red Spruce". Wonderful West Virginia. 74 (12): 6–11. ^ Bove, Jennifer. "Appalachian Red Spruce Forest". Retrieved 27 February 2014. ^ Rentch, James; T. Schuler; M. Ford; G. Nowacki (September 2007). "Red Spruce Stand Dynamics, Simulations, and Restoration Opportunities in the Central Appalachians". Restoration Ecology. 15 (3): 440–452. doi:10.1111/j.1526-100x.2007.00240.x. Retrieved 27 February 2014.